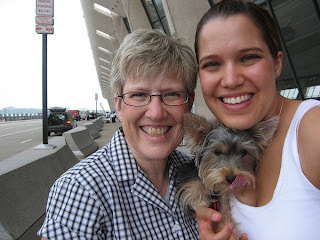 Me, Riley and my Mom at the airport in D.C. right before I took off for Scotland. When I moved to Scotland 18 months ago, so much was unknown. I didn't know what to expect. I didn't know how this would change my life. And change my life, it has. I moved from a society that is based on consumer goods, to a society where money isn't flowing as much. A society where going out to dinner once a month is "normal" and you would never take the kids with you to a restaurant (though this doesn't really matter since I don't have any!). A society where the healthcare is "free" and you pay a tax on your tv. A society that has changed my perspective on life. I am glad that my need for materialism has been broken. Living over here, cars, the size of your tv and even clothes don't really matter. On the other hand, taking exotic vacations are a big deal. Most people get at least five weeks paid vacation a year and use it all, if not more! People genuinely try to care about the planet, not the way Americans say they do. People drive cars (which most people that I know don't even have cars) that have very little power and very high gas mileage...the Prius over here is always made fun of, as to the Brits it isn't a green car, just an average one. People use only canvas bags at the grocery store. I still can't get over the fact that I pass a huge castle everyday and it has become "normal" to me. I can understand the accent better than when I first came...Ian even likes to tease me because I say some of my words differently now. I no longer email daily updates to my friends and family back home, but that doesn't mean I don't still think about them. I still think I see someone I know in the streets, only to realize that person is 7500 miles away. I've learned to cook with different types of food, and don't eat read meat often (it has a weird flavor to it). I go to the grocery store at least every other day and am still always out of something. Buying in bulk is not an option. It isn't just about transporting it, but I have no storage space in my tiny little flat. Jessica I miss you, Iyour new approach to life sounds wonderful. Now if people don't bring kids out to eat with them...why am I looking at plane tickets to Scotland for THREE? ?